Six months ago today, Hurricane Maria struck Puerto Rico, leading to the longest blackout in American history. The reconstruction efforts continue, including the long, costly, and complicated project to rebuild its electric grid. With nearly 150,000 people on the island still without electricity, locals say that they don’t expect power to be fully restored until May. To help raise awareness for the continued relief efforts, executives from Blockchain Beach and LA-based digital media brand What’s Trending, visited the World Central Kitchen to cook and deliver hot meals to hurricane victims. Celebrity Chef Jose Andres founded the nonprofit organization in 2010 after the devastating earthquake in Haiti. Chef Andres, who owns The Bazaar and Tres restaurants in Beverly Hills, traveled to San Juan last September to expand the World Central Kitchen’s Relief Network. 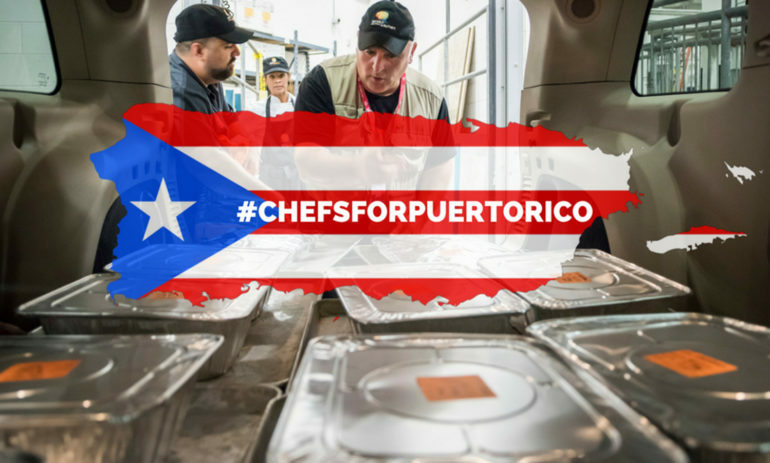 These chef-driven relief programs across the island are collectively known as #ChefsForPuertoRico. With 22 kitchens serving 78 municipalities, #ChefsForPuertoRico is the island’s largest feeding operation. On the ground, the logistics are spearheaded by World Central Kitchen COO Erin Schrode, who relocated to the island just days after the hurricane. She manages an all Puerto Rican team and is headquartered in Bayamón, which is the island’s second-largest municipality and part of the San Juan metropolitan area. According to Schrode, her operation has prepared and delivered almost 3.3 million meals since September 2017. Schrode works closely with Puerto Rican government officials to create sustainable jobs to boost employment among food service workers. The Kitchen is staffed by chefs who are local to the island and local ingredients are used in all prepared meals. In addition, they have established locally sourced supply chains whenever possible. When asked about the Blockchain community’s impact in Puerto Rico, Schrode suggested that her operation could serve as a model for how Blockchain companies can successfully partner with locals. In order to maximize impact, the World Central Kitchen team coordinates with local officials and law enforcement to prioritize the relief efforts serving the most vulnerable populations, including the sick and elderly. A surprisingly large number of meals were hand-delivered to victims in still-decimated rural areas. Along the food delivery route on the outskirts of town, much of the electrical infrastructure remains physically knocked down. Dump trucks and utility company contractors were commonplace along the relief route. There was also a U.S. Army Corps of Engineers team, based out of Mobile, Alabama, who were evaluating water drainage improvements for better flood control in the area. The meal delivery continues each day until 11PM (or until they run out of food). The World Central Kitchen plans to continue serving around 5,000 meals daily until June of this year.